Much has been written about the Five Mother Sauces–the sauces that master chefs will tell you are the basis and the building blocks upon which most sauces are built: Béchamel, Velouté, Espagnole, Tomato and Hollandaise. To that, so many people today would respond in this way: “Sure, but who has time?” That’s why I’m moving tomato sauce, in the form of Marinara or Pasta Sauce, to the top of the list. Because I want you to know that it only takes five ingredients and 10 minutes to make a wonderful, fresh and vibrant sauce for your pasta or Chicken Parmesan! 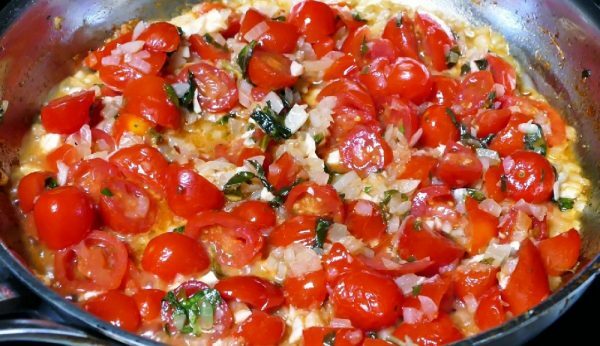 With some sweet yellow onion, a little garlic, tomatoes, basil, red pepper flakes, salt and pepper you can have Marinara Sauce in no time! It’s really that simple and delicious. Now you can make it fresh anytime you are craving Italian! Watch my How To Video for 10 Minute Pasta Sauce here! Béchamel, the classic white cream sauce is probably used most frequently in all types of dishes. Made by stirring milk into a butter-flour roux, the thickness of the sauce depends on the proportion of flour and butter to milk. Velouté is a stock-based white sauce. It can be made from chicken, veal or fish stock. In a medium saucepan, heat olive oil and sauté onions and garlic until softened, about 3-4 minutes. Add tomatoes, basil and red pepper flakes. Cook for another 4-5 minutes. When done, add salt and pepper to taste. Perfect for Pasta or Chicken Parmesan. In medium saucepan, melt butter and flour to make rue. Add cream, dash of fresh grated nutmeg, and cheese. Stir until well blended and begins to thicken. Add salt and pepper.